"It was easy to hide behind the dull face I wore ...I thought I had everybody fooled." So what's up with this year's Booker Prize longlist? Both Eileen and Menmuir's The Many (the two I've read so far) are really dark reads peering into damaged psyches. I like this sort of thing, but had I known that my random choice of these two books one after the other would make for such disturbing reading, I probably would have read something lighter in between the two. Dark fiction appeals to me, but this pair of books together left me a bit gutted. "If Jim Thompson had married Patricia Highsmith – imagine that household – they might have conspired together to dream up something like Eileen." Thompson I'm not feeling so much, but there is something akin to Highsmith in here in the sense that Moshfegh has written a book that left me wanting to take short breaks from roaming around in her repulsive main character's head. This novel takes on a week in the life of Eileen Dunlop as recalled by an older self some fifty years later, looking back to her last days as "angry little Eileen" leading up to the moment when she makes an escape from strange "life of a nobody, a waif, invisible." Keeping in mind that in this novel appearances can be somewhat deceiving and that there's much more going on than meets the eye, whether or not we should be cheering her on is a judgment call that can't really be made until the final page has been turned. While I'm not going to go into plot so as not to spoil things, it's beyond appropriate that Eileen works in a "private juvenile facility for teenage boys," "for all intents and purposes -- a prison for children," since one of the main ideas in this book seems to be how people come to find themselves in his or her own form of imprisonment. Eileen is stuck in her house taking care of her widowed dad, a stubborn ex-cop who is now drunk most of the time which Eileen prefers since she can "just hand him a bottle and leave the room" when he needs to be distracted or soothed. When he asks her to buy him more booze, instead of arguing, she's glad to get out of the house to kill time. She's stuck in a body she despises to the point of repulsion and self-loathing, she's stuck in the past, wearing her deceased mother's clothes. She's stuck in her "brutal cold town," just counting the days until she can make her escape, viewing life as "one long sentence of waiting out the clock." But, as we learn, Eileen isn't the only one who is stuck or imprisoned. And Eileen has secrets that she shares with no one except us. On the other hand, she's not the only one -- most of the main characters in this novel have secrets that will slowly come tumbling out and trust me, they're pretty horrific. Thinking of the secrets people keep here reminds me of the author's focus on masks. Eileen wears her "death mask" at work, since she is "terribly sensitive and determined never to show it." She finds that in order to get through her work day, she has had to "steel herself from the reality of the place..." since she was surrounded by "misery and shame." Her inspiration -- a book she'd discovered at a library that "showed casts of faces" of several notable historical figures. Practicing regularly and "diligently" at a mirror, she worked toward achieving, as she notes, "an aura of benign resilience, such as I saw in those dead men's faces." Again, though, she's not the only one, and it seems to me that the author spends a lot of time getting to the root of what's behind the masks these people wear. There's much more of course, but it is definitely a book that needs to be experienced rather than simply talked about. While the dustjacket blurb says that there's a "Hitchcockian twist" in this novel, I didn't feel that one either. It's true that this "twist" is important to the overall story, but I kind of saw it coming so it wasn't as much of a "Hitchcockian" moment as I was led to believe by the blurb. I don't really think that plot is really the main focus here; it's much more a book about people and damage and how they end up being the way they are. 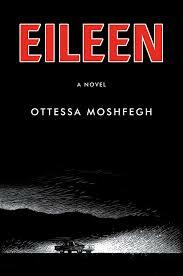 Eileen turned out for me to be much less about reading a novel and became more of a foray into a seriously disturbed mind or two or three, and I liked it. Creepy, yes. Repulsive and uncomfortable, at times. Difficult subject matter, definitely. But how people end up where they are in their lives and why they do what they do absolutely fascinates me and it's all here.